Home News 2019 This billionaire reportedly paid $60K for a portrait of Trump. He was allegedly reimbursed by Trump’s charity. This billionaire reportedly paid $60K for a portrait of Trump. He was allegedly reimbursed by Trump’s charity. (CNN) Stewart Rahr is a pharmaceutical billionaire, self-described “king of all fun” and, as President Donald Trump told a magazine, a real character. “The objective was to ensure that his portrait, which was going to be auctioned last, would go for the highest price of any portrait that afternoon,” Cohen said in his opening statement Wednesday to the House Oversight Committee. He also described the bidder as a straw buyer, who makes a purchase on behalf of another person. The bidder was reimbursed by the charity Trump Foundation, Cohen told the House Oversight Committee. CNN made several calls and emails to Rahr, but did not receive a response. On one attempt, a man who answered the phone said he could get Rahr on the line but hung up once he found out it was CNN calling. Rahr declined to comment when the Washington Post reported on Trump’s charitable giving in 2016. CNN also reached out to the Trump Organization but has not yet received a response. In 2015,Dan’s Papers, a lifestyle publication in the posh Hamptons on Long Island, reported that the portrait’s artist, William Quigley, had heard about Trump’s interest in the painting and was told to raise the starting bid. 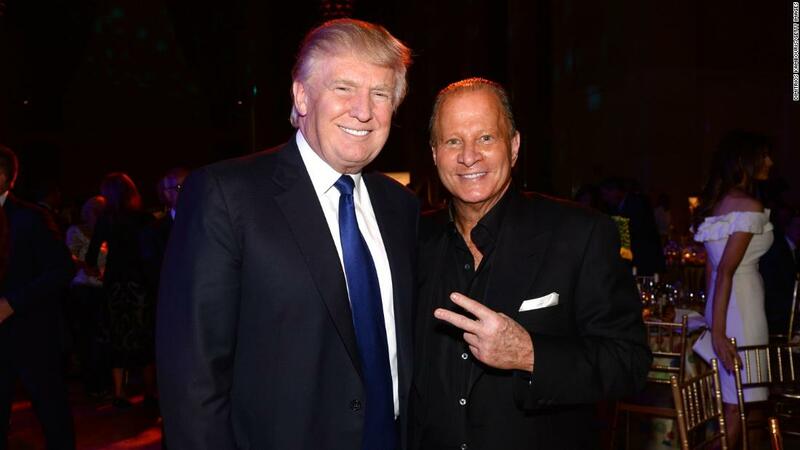 Trump asked his pal Rahr to bid on his behalf at the 2013 auction, according to Dan’s Papers. “Mr. Trump directed the Trump Foundation, which is supposed to be a charitable organization, to repay the fake bidder, despite keeping the art for himself,” Cohen testified. The Trump Foundation dissolved in late 2018 amid a New York state lawsuit that claimed it violated campaign-finance laws and abused its tax-exempt status. One of Cohen’s exhibits includes a news article saying that Rahr, a prominent art collector, made the purchase. The item is circled and labeled “Michael C.” Cohen testified that Trump’s handwriting was on a copy of a New York Daily News article about the sale. Trump tweeted about the winning bid a few days later, but didn’t mention having any role in it. “Just found out that at a charity auction of celebrity portraits in E. Hampton, my portrait by artist William Quigley topped list at $60K,” Trump tweeted. According to a 2013 Forbes profile, Rahr, now in his early 70s, built his fortune through his family business Kinray, a drug distribution company. In 2010, he sold Kinray to Cardinal Health for $1.3 billion. Page Six has frequently written about Rahr’s Gatsby-esque, lavish spending and wild antics. Rahr, who refers to himself in the third person as “Rah Rah,” was banned from the famed sushi restaurant Nobu in 2012 for cursing out the manager, according to the New York Post. His gun license was also suspended for a period of time after a heated exchange with an elevator operator that same year, The New York Times reported. And much like another New York billionaire, he’s often seen posing for photos with celebrities. So where is the portrait now? It’s hanging in one of the President’s country clubs, Cohen said. I Made 20 Answering My First Survey in 20 Minutes. See How I Did It. Learn The Secrets To Make Money In The Comfort Of Your Own Answering Simple Surveys Online. Discover how to build your list with 50 guaranteed leads daily and get paid to do it. Learn how to get paid to drive your own brand new car. Make an extra or full-time living from your photography. Discover how you too can easily make money enjoying yourself as a video game tester. Over 350 Companies Ready To Hire Take Online Surveys for Cash. Local Interactr Entrepreneurs Club instantly releases 2 additional Interactr Local Video Funnels and you will receive 2 brand new exclusive interactr local video funnels each month. Live Event Blaster 2 is a software that exploits the power of YouTube live events. Start ranking live events on the first page of google! Video Player for Recastly users. A powerful player that will make your videos play on your websites. Easy to use. TrafficBuilder 3.0 - Agency TrafficBuilder is a breakthrough software for 100% FREE buyer traffic with results being delivered within minutes. This is a 1st of its kind software that has NEVER been replicated by any other marketer. Smart Funnelz Gold PRO (Discount) Create Unique Funnels That Guarantee To Sky Rocket Your Opt-In Rate And Generate Leads, Sales and Commissions on Demand! Flickstr SILVER Flickstr SILVER : Revolutionary LIVE ACTION video maker for HIGH converting and HIGHLY engaging, BOX OFFICE office style videos. LOWEST One-Time Launch Special Price Today ONLY! LIVEreel - Advance LIVEreel Advance is a cloud based software that let you go live using a pre-recorded video on multiple social networks at once. Advance comes packed with additional features to make it much more easier to do live videos.